Fiology thanks Good Nelly of My Way of Viewing for shaping this lesson. Nothing is constant in this world and neither is marriage. No one knows whether or not your marriage will work out the way you want. So, instead of being emotional and leaving everything for the future, you can, at least, secure your financial life in case of a death or a divorce. A prenuptial agreement or a premarital agreement can help you avoid a messy divorce, in case that situation arises. Often referred to as an antenuptial agreement, a prenuptial agreement is a written contract created by both the persons who are about to get married. The contract has a list of all the details of the property along with the debts each of the people owes and the property rights after a divorce. Contrary to the popular belief, a prenuptial agreement is not only for the rich, but for anyone who has decided to get married. If there’s no prenup, a community property (that is, property acquired during marriage) is divided as per the specific laws of the state. 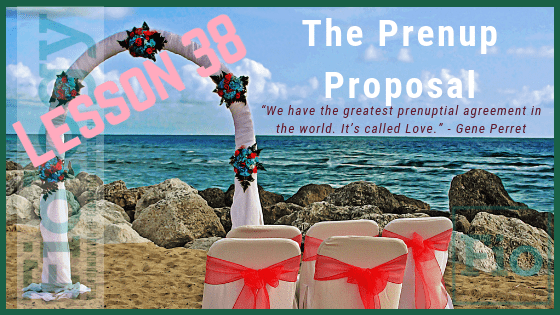 This lesson is designed to break through the stigma attached to prenuptial agreements and let us see it for what it is, a responsible consideration for those who care about their finances and their future selves. If you decide to move forward with an agreement, here are the steps to prepare the draft and make it a legal contract. Hire an attorney – Take reference from your friends and relatives and hire separate attorneys. Hire the most suitable one, consult with him/her to prepare a draft. Have a discussion with your partner – Have a friendly conversation with your partner about your respective finances. Keep the conversation as professional as possible. Have a clear idea of the financial situation – Make a list of each of your debts, assets, income, and what you’re expecting from your investments. Research about the laws in your state – Get an idea about the specific laws in your state about distribution of assets. Include provisions about how to handle finances – It is better if you have, in writing, how each of you will handle finances after your marriage. Make it a legal contract – Make sure the agreement is fair for both of you and both of you read it thoroughly before signing it. And, most importantly, make the agreement official and legal.